Clifton is a beach suburb close to central Cape Town. 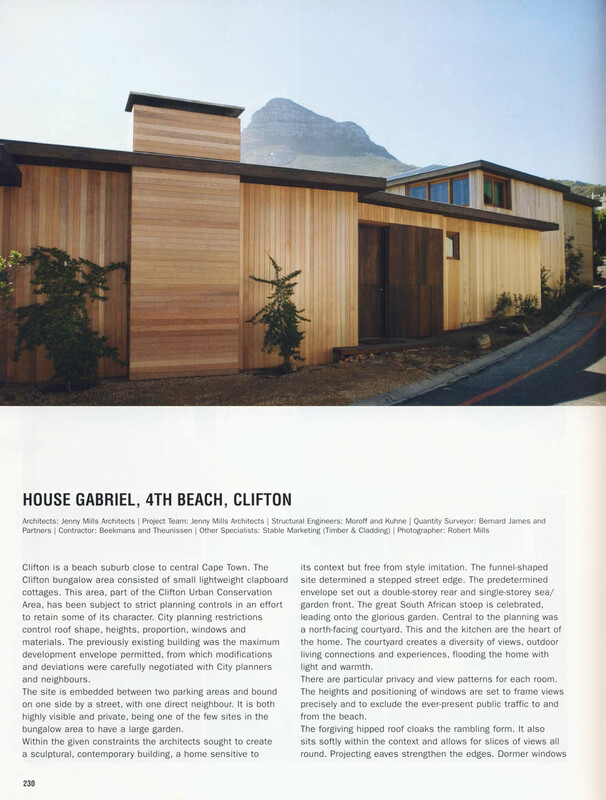 The Clifton bungalow area consisted of small lightweight clapboard cottages. This area, part of the Clifton Urban Conservation Area, has been subject to strict planning controls in an effort to retain some of its character. City planning restrictions control roof shape, heights, proportion, windows and materials. The previously existing building was the maximum development envelope permitted, from which modifications and deviations were carefully negotiated with City planners and neighbours. The site is embedded between two parking areas and bound on one side by a street, with one direct neighbour. It is both highly visible and private, being one of the few sites in the bungalow area to have a large garden. 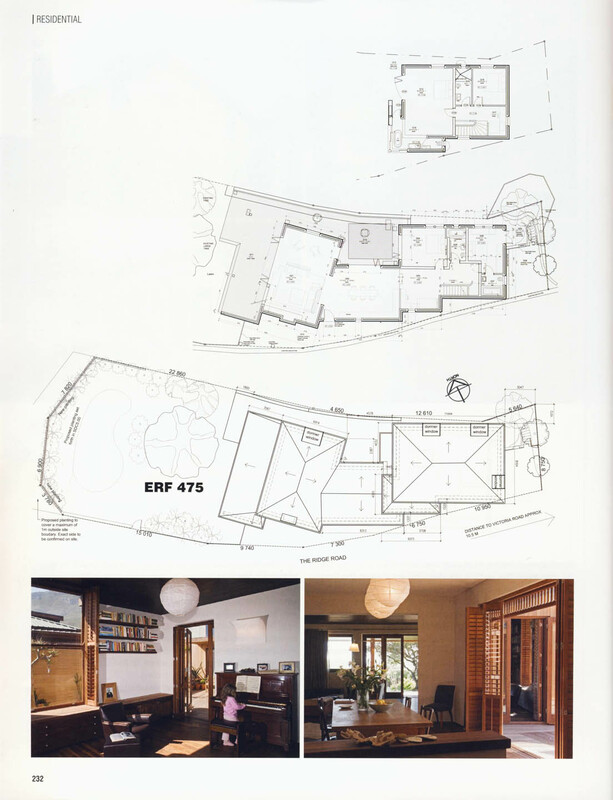 Within the given constraints the architects sought to create a sculptural, contemporary building, a home sensitive to its context but free from style imitation. The funnel-shaped site determined a stepped street edge. 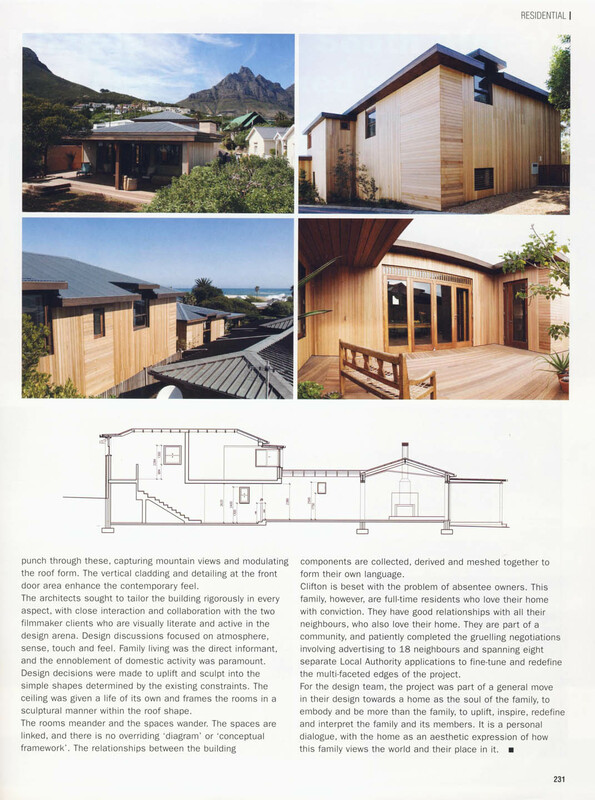 The predetermined envelope set out a double-storey rear and single-storey sea/ garden front. The great South African stoep is celebrated, leading onto the glorious garden. Central to the planning was a north-facing courtyard. This and the kitchen are the heart of the home. The courtyard creates a diversity of views, outdoor living connections and experiences, flooding the home with light and warmth. There are particular privacy and view patterns for each room. The heights and positioning of windows are set to frame views precisely and to exclude the ever-present public traffic to and from the beach. The forgiving hipped roof cloaks the rambling form. It also sits softly within the context and allows for slices of views all round. Projecting eaves strengthen the edges. Dormer windows punch through these, capturing mountain views and modulating the roof form. The vertical cladding and detailing at the front door area enhance the contemporary feel. The architects sought to tailor the building rigorously in every aspect, with close interaction and collaboration with the two filmmaker clients who are visually literate and active in the design arena. Design discussions focused on atmosphere, sense, touch and feel. Family living was the direct informant, and the ennoblement of domestic activity was paramount. Design decisions were made to uplift and sculpt into the simple shapes determined by the existing constraints. The ceiling was given a life of its own and frames the rooms in a sculptural manner within the roof shape. The rooms meander and the spaces wander. The spaces are linked, and there is no overriding 'diagram' or 'conceptual framework'. The relationships between the building components are collected, derived and meshed together to form their own language. Clifton is beset with the problem of absentee owners. This family, however, are full-time residents who love their home with conviction. They have good relationships with all their neighbours, who also love their home. They are part of a community, and patiently completed the gruelling negotiations involving advertising to 18 neighbours and spanning eight separate Local Authority applications to fine-tune and redefine the multi-faceted edges of the project. For the design team, the project was part of a general move in their design towards a home as the soul of the family, to embody and be more than the family, to uplift, inspire, redefine and interpret the family and its members. It is a personal dialogue, with the home as an aesthetic expression of how this family views the world and their place in it.